Industry Leading Stretch Film Banding Equipment. 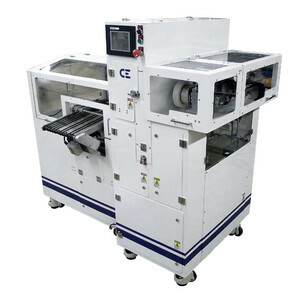 The CE Stacker unit collects product from an up-stream operation such as a card affixing table or binding machine. The product collects in a hopper until either a predetermined count is achieved or a sort signal is received from the up-stream equipment. Product is dropped in the push position and indexed into the banding position. The pusher is driven by a high speed stepper motor.